This all started innocently on a typical Monday evening. Dinner is on the table and the menu is Salmon baked in sweet vidalia onion dressing, cous cous with pine nuts and dried cranberries, and a salad. Yum! Everything was devoured with gusto except the fancy cous cous – it was enjoyed by only 3 1/2 out of 5 of us (my son, who still thinks I walk on water, suffered through the cous cous because he knew it would make me happy. Gotta love that kid!). Then, by Wednesday morning (yesterday) something weird was going on with my ….. mouth/palate. I ate my Honey Bunches of Oats as I do most mornings and it tasted really funky (it had a metallic aftertaste). Maybe it was stale? I made my mug of coffee (as I do each morning) and began drinking my coffee on the way into the office. It tasted really bitter – that’s weird! I must not have put my usual 3 packets of cancer-causing sweetener into my coffee mug. I suffered through it anyway because I needed my daily infusion of caffeine. Dinner time! It is sandwich night because, well, my day did not go as planned (we were going to have baked chicken thighs with roasted cauliflower), but as you will see below that plan was not executed. 3pm – Home in time to greet son just off of the bus. He practices piano while I race around the house changing into my workout clothes, packing my husband’s workout bag (so he can meet me at the gym), and packing my daughter’s piano bag. I also spent about 15 minutes looking for my hubby’s iPod to no avail. 3:45pm – Run out of the house with my son and all of the various packed bags. I head to the middle school to pick up my daughter for her piano lesson (both my son and daughter have piano lessons on Wednesdays). Pick up daughter at 3:55pm and race to lessons which begin at 4:00pm. 4:00pm – Maddie goes first. I hang around until 4:30pm then rush her home (Jack is now in his lesson) so she will be ready for her 5pm carpool to soccer practice. Then I run back over to piano lessons for Jack pick-up. 5:00pm – Take Jack over to my in-laws where my husband is visiting with his parents. He has decided not to workout with me (he was confused by my invite to exercise together). 6:20pm – I get home from workout and am way too tired to make chicken and cauliflower, thus sandwiches. For dinner, I make myself a nice roast beef sandwich dressed with mayo, avocado, cheese & tomato. I also have some strawberries and few chips. Yummy! I take a bite out of my sandwich and……YUCK! It tastes like CRAP! Strawberries – disgusting! Chips – downright vomit-inducing! What the hell is going on?! Now, I’m thinking I’ve got some deadly disease since everything I’m eating tastes like bitter metal (not that I eat a lot of bitter metal, but if I did, this is what it would taste like). I go to WedMD and guess what I have??? I’m not kidding – watch the video. This guy could be me!! My symptoms started exactly two days after eating those damn pine nuts! WebMD Pine Mouth Video Link. 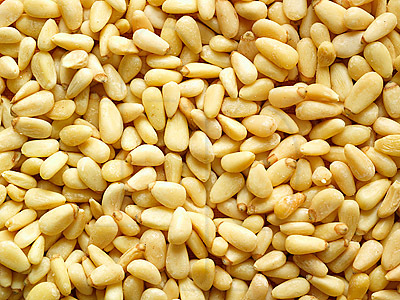 Also, read this article from ABC News – ‘Pine Mouth’: How Pine Nuts Can Ruin Tastebuds for Weeks. No one else in my family is suffering from it – thank goodness. I can’t imagine listening to my kids whine about their bitter food (now, they all have to listen to me!). According to the article, this is temporary but can last 1 to 4 weeks! Oh brother. For the next four weeks, my food will taste like sh*t! Maybe I’ll be one of those lucky ducks that only has these symptoms for a week. It’s now Thursday and it has gotten worse – I wish I could explain how horrible my Honey Nut Cheerios, my coffee and my sandwich tasted today. I am now forcing myself to eat which is really a new concept for me. I’m really not looking forward to dinner which is going to be the baked chicken thighs and roasted cauliflower. I love this dinner – it’s usually tasty (and very quick & easy), but now I know it’s going to taste really, really nasty. My sister thinks this might be the newest diet miracle and it’s all wrapped up in a tiny inedible version of the pine nut from China (read the article)! This new development means no more pesto, roasted pine nuts on salads, etc. However, it could be way worse, right? At least I still have my health! This entry was posted in Everyday Life and tagged bitter aftertaste, metallic aftertaste, pine mouth, pine nuts, weird diagnoses. Bookmark the permalink. ← What’s Everyone Been Up To?